Most sports fans in the know will share that nothing is better than a playoff hockey and the best of playoff hockey comes in the form of a Game 7 match-up where everything is on the line. That is why tonight we have been blessed with a unique and wonderful situation as there are THREE Game 7’s in the NHL®! Clear your calendar. Get a hall pass from the wife. Find a comfy chair in front of a great big television and enjoy! Get ready for greatness ladies and gentlemen. 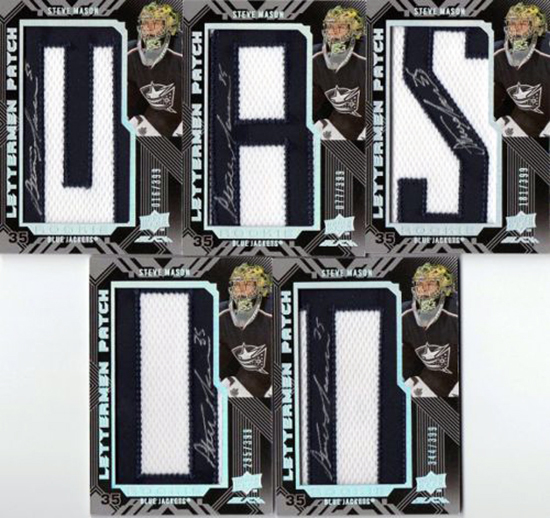 While the impact of these games may have huge implications in the total playoff picture and who ultimately hoists the Stanley Cup®, it could also have implications on the trading card collections of many a fan. Let’s take a look at who has the most to lose and gain in these epic contests this evening. 10. Patrick Roy – He is one of the greatest goalies in hockey history, but can he show he is ready to become one of the greatest coaches? He only lost twice at home in Game 7’s as a player, but tonight is a whole different ball of wax. 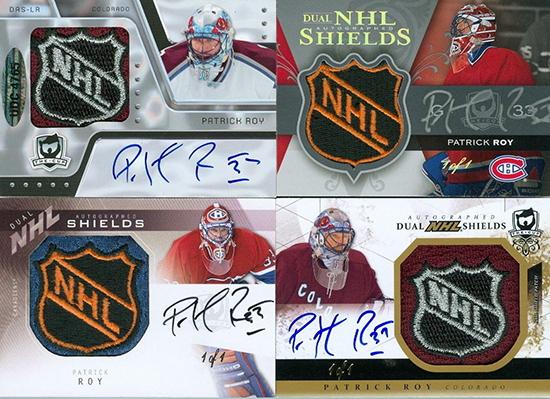 It will be interesting to see if success for Patrick Roy as a coach will translate to increased interest in his collectibles. 9. Steve Mason – In terms of the hobby, even though Steve Mason came in with a franchise not typically high in collectible demand, there was buzz about him. Going from the Blue Jackets to the Flyers has been good for him. Tonight is a big opportunity for him to show Flyers fans, he is worthy of their hobby love. 8. 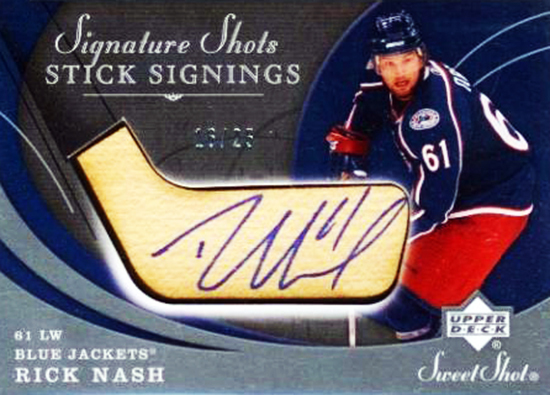 Rick Nash – Another former Columbus stand-out who has benefitted from moving to a bigger market is Rick Nash. He has always had a good following as a strong member of Team Canada, but now in New York he is getting the attention he rightfully deserves. It is a great shot for him to take his collectible value to the next level. 7. Gabriel Landeskog – A true “Young Gun,” Landeskog has been looking for that big moment and there is no better platform for it than a Game 7. We’ll see if he is ready to take his game to the next level. If he does, we could see his rookie cards on the rise! 6. 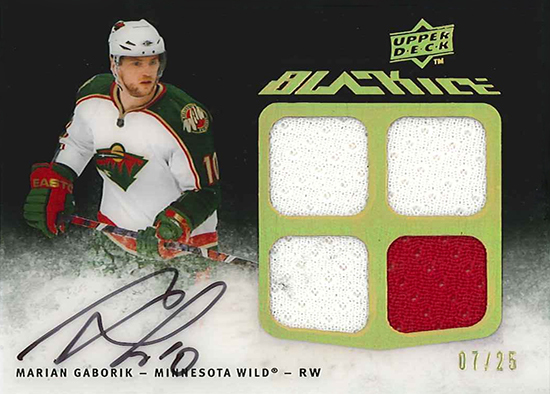 Marian Gaborik – Has played extremely well and is definitely a star in the league, but because he has traveled a bit from the Wild, the Rangers, the Blue Jackets and now the Kings, most in the hobby have a difficult time with him, unless you are a collector from Slovakia. If he can make an impact tonight and help the Kings get back to the Stanley Cup® Final, collectors will be forced to give him another look. 5. 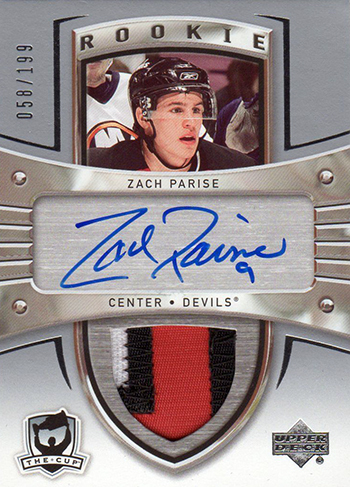 Zach Parise – He recently had an amazing game and a four point night and has done very well in Olympic contests as well for Team USA. His place in hobby stardom is unsecure however as he is generally considered a semi-star. With a memorable performance tonight and beyond, he could take things to the next level in the collectibles category. 4. 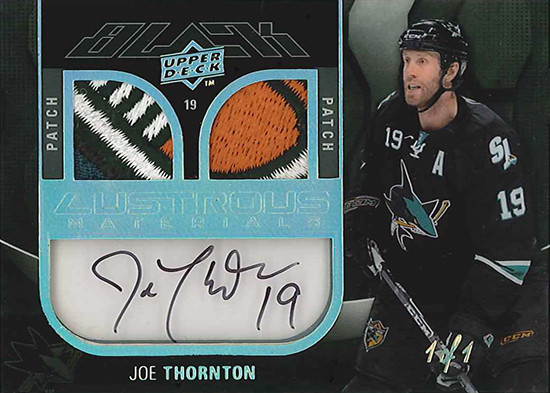 Joe Thornton – The captain of the Sharks has done an amazing job at improving the franchise by getting the team to play loose and have fun. Having met Thornton a couple times, he is a guy you want to root for, definitely a great ambassador for the game. His play, however, has been quiet as of late and it is critical that tonight he helps prove why he has that “C” on his chest. 3. Henrik Lundqvist – The Rangers are 5-0 all-time in Game 7’s at the Garden so the hockey analysts like Henrik’s shot tonight. 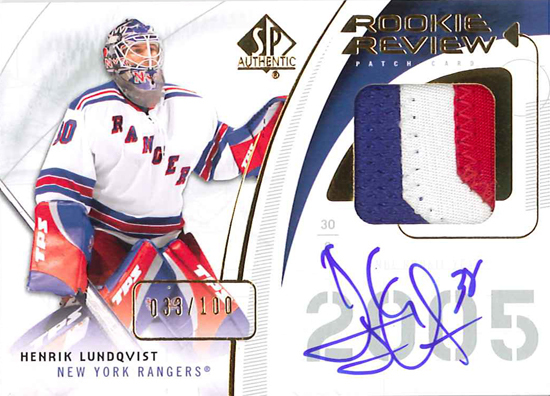 The spotlight doesn’t shine brighter than in the “Big Apple” and tonight is an excellent opportunity for Lundqvist, who is already very popular in the collectibles world, to show he is one of the best. 2. 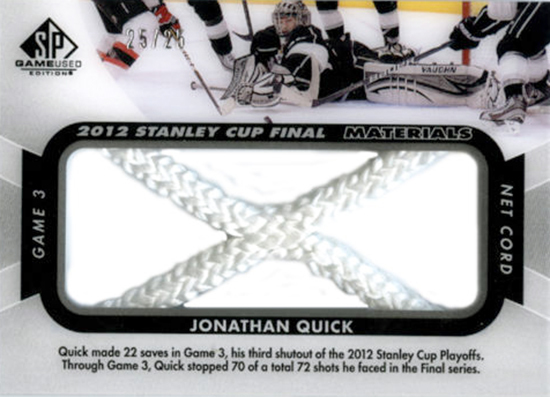 Jonathan Quick – He became almost an immediate darling in the hockey collectibles world after helping the Kings hoist the Cup, but a disappointing finish in the Olympics and a Jekyll and Hyde performance thus far in this series has collectors on the fence with him again. Can he pull it together to regain his place as one of the most collectible goalies? We will find out tonight! 1. 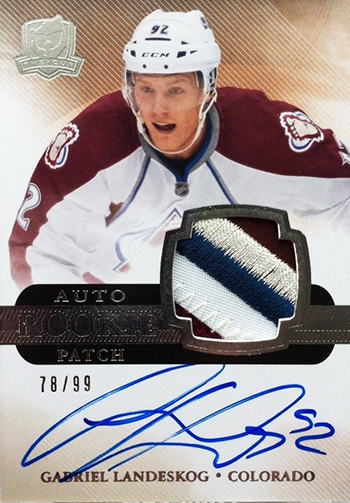 Nathan MacKinnon – He has been the star of Upper Deck’s Double NHL® Rookie Class and helped Colorado make the playoffs. He seems to be the can’t miss pick for the Calder this year and if he can make a name for himself in the playoffs as a rookie, well, you better score his rookie cards while you can. Excuse me while I crap my pants, these cards are sooo cool, there insane! Upper Deck – Fans of the game as well as the best maker of cards! Ya’ gotta’ love it!